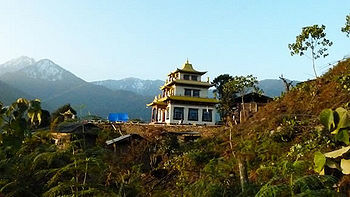 Deden Tashi Chöling is a Nyingma temple in Lower Pemakö, now in the northern part of India, founded by Togden Kunzang Longrol on the instructions of Dudjom Rinpoche. The center follows the Dudjom Tersar lineage. Khorlo Dratsang, the original dharma center of Dudjom Rinpoche in his birth village Terkong Nang was located in Upper Pemakö, Powo, Southern Tibet. In the light of the political turmoil in Tibet around 1959, Dudjom Rinpoche asked Togden Kunzang Longrol, one of his main student in Terkong Nang, to relocate the center and its sacred objects to the India-controlled part of Pemakö, which became knows as the ‘Lower Pemakö’. After fulfilling Dudjom Rinpoche’s request, Togden Kunzang Longrol built Deden Tashi Chöling temple on this chosen site in lower Pemakö. Many senior practitioners from Upper Pemakö and Powo traveled and settled in Deden Tashi Chöling and began to spend their lives around this temple and in their own small retreat huts. Togden Kunzang Longrol enshrined in this temple the many sacred objects he had brought with him from Upper Pemakö and Powo, including the two stupas which hold the sacred remains of Dudjom Rinpoche’s root teacher Gyurme Ngedön Wangpo, and of his mother Yum Namgyal Drolma, which were brought from Khorlo Dratsang. Many other precious and blessed objects from Tibet were placed inside these six sacred statues. The activity of Deden Tashi Chöling has been recently increased by Tulku Orgyen Phuntsok, recognized as the incarnation of Togden Kunzang Longdrol. 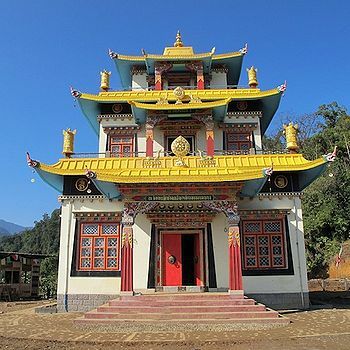 Led by Tulku Orgyen Phuntsok, the construction of the temple was fully completed, with an architecture in the form of Zangdok Palri, the Copper-Colored Mountain, with its complete contents and surrounding facilities as long-envisioned by all the previous masters of the center. The temple was the first ever of its kind in this part of Pemakö. In January, 2013, Deden Tashi Chöling temple was consecrated, with devoted people coming from many villages from Pemakö and far way cities and countries. ↑ The Khandro Tuktik cycle is a mind treasure discovered by Dudjom Rinpoche at the age of nineteen while he was in Dragsum Kongpo, Southern Tibet. This page was last edited on 13 February 2016, at 21:30.